Are you obsessed with Sputnik, the Space Race, Googie architecture and radioactive powers for superheroes? Look out, it seems like your fetish is about to get a name: "Atompunk." 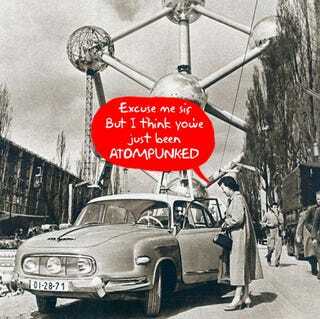 According to a mailing list from the Netherlands, Atompunk is devoted to the cultural period (mostly of the United States) of between 1945 to 1965. While the moniker hasn't become a part of our country's vernacular yet (though I'm sure some of you already started using it ages ago), it sounds just annoyingly catchy enough to warrant a New York Times trend piece in about eight years. And the Dutch aren't helping, devoting a festival to it in Amsterdam for September 2009.